Etude House's True Relief skincare line consists of 3 products - the Moist Mist Toner, Moist Emulsion, and Moist Cream. 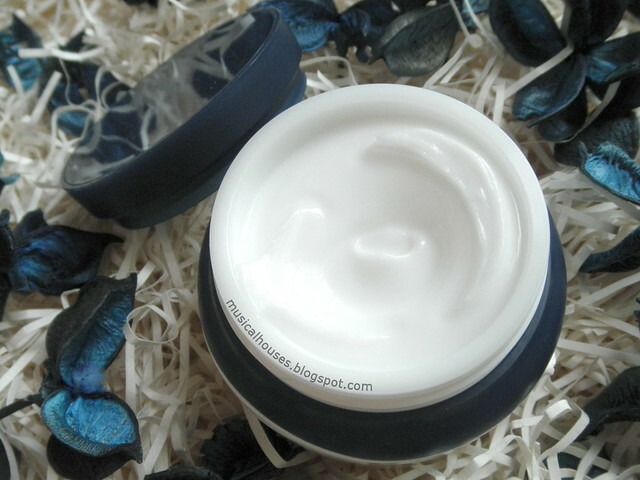 As the line indicates, this is supposed to offer "true relief" for sensitive skin, without irritation. This certainly is pretty unusual as compared to Etude House's typical skincare range, which tends to be geared for a pretty young age group, as it seems geared towards a broader age range. So this is actually a fairly unusual step as far as Etude House skincare goes, and I'll be taking a look at how this fares! If you've read some of my Etude House reviews, you'll probably know that while I do love their makeup products in general, their skincare tends to be something I'm more ambivalent with - in fact, my last Etude House skincare product review wasn't exactly a positive one. This is perhaps because at nearly 30, I'm slightly older than the typical Etude House customer, and a lot of their skincare products are really best for very thick and oily skin. So, I was kind of interested to see if finally, there was a skincare range from the brand that made more sense for my skin type. And as usual, for each of the products - the True Relief Moist Mist TOner, Moist Emulsion, and Moist Cream, we'll start off the review with a look at the ingredients list! We have three products here, so it might be a tad (just a tad, don't worry) longer than the average review, but I'll try and keep it as short and sweet as I can! Let's start with the True Relief Moist Toner, since it's the first step of the routine. It comes in a spray bottle, and you're supposed to spray the toner directly onto your face (as opposed to spraying onto a cotton pad and then wiping your face with it). Let's take a closer look at what's in the toner! The ingredients in the Moist Mist Toner are water, solvent (Propanediol), humectants (Glycerin, Hyaluronic Acid), Ceramide 3, a variety of plant extracts (Chicory Root Extract, Prunus Mume Fruit Extract, Chestnut Seed Extract, Mushroom Extract), and then we hit the first preservative, Ethylhexylglycerin, so we know we've looked at the key ingredients in the Mist Toner. The rest of the ingredients include thickeners (Xantham Gum, Glycereth-26), humectants (Butylene Glycol), film formers (Acrylates/Stearyl Methacrylate Copolymer) and preservatives (Disodium EDTA). From the ingredients list, we can see that the Moist Mist Toner is basically a very lightweight water-based lotion-type product, comprised primarily of water and humectants. There is also Ceramide 3, which is great, and one of my favourite ingredients (I've gone into some detail on Ceramides and their benefit in my review of the Elizabeth Arden Ceramide capsules sometime back). And ceramides aren't that commonly found in toners or lotions, and can be useful for sensitive and aging skin, or skin with a compromised barrier function, so I'm always happy to see them included in more products. So as far as toners go, this is a pretty nice one. 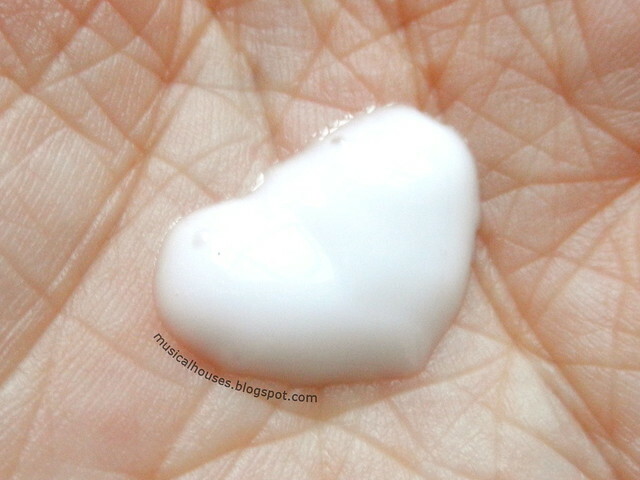 It isn't really drying or harsh, and has some ingredients that are great for sensitive or dry skin. And more importantly, unlike some of the other Korean skincare products I've tried, this one doesn't seem to have any fragrance or potentially irritating ingredients - for example, the choice of plant extracts doesn't include potentially irritating citrus or fragrance plant oils. So as far as formulation goes, I don't have anything to complain about, really. On the skin, the Etude House Moist Mist Toner also does pretty well. I like the nifty spray bottle, and think it's pretty travel-friendly. 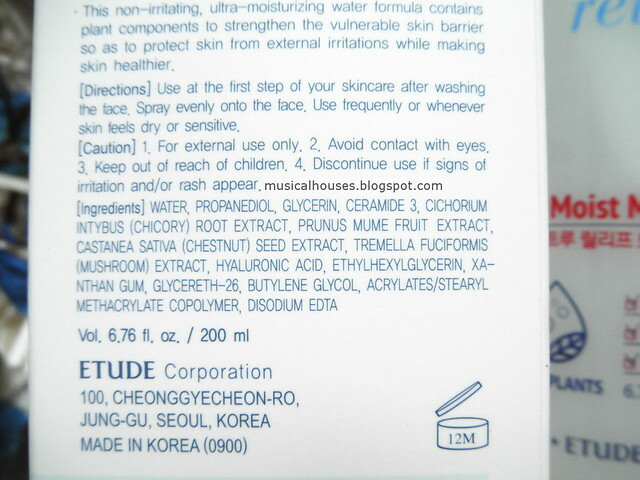 I also liked that it didn't have any very strong fragrance as some Etude House products sometimes do. It also worked well on my skin - it helped my skin seem more moisturized, and was a pretty nice prep step for the rest of my skincare. It didn't feel oily or sticky on my skin and absorbed nicely, too. And now that we've looked at the Moist Mist Toner, let's check out the next step, which is the True Relief Moist Emulsion. This comes in a pretty useful pump bottle, and is actually really large in size - you get a good 180ml of product here, which is plenty! The emulsion consists of water, humectants (Glycerin, Butylene Glycol), emollients (Pentaerythrityl Tetraethylhexanoate, Shea Butter, Dimethicone, Cetearyl Alcohol), and emulsifiers (C14-22 Alcohols, C12-20 Alkyl Glucoside, Glyceryl Stearate, Glyceryl Caprylate, Sodium Stearoyl Glutamate), some of which also do double duty as emollients. There are also a variety of plant extracts (Prunus Mume Fruit Extract, Chestnut Seed Extract, Chicory Root Extract, Mushroom Extract), and Ceramide 3. There are also film formers (Acrylates/Stearyl Methacrylate Copolymer), preservatives (Ethylhexylglycerin, 1 2 Hexanediol, Disodium EDTA), thickeners (Xantham Gum, Carbomer), and pH adjusters (Potassium Hydroxide). From the ingredients, we can see that this is definitely more of a creamy-type emulsion, rather than a watery-type emulsion, as it has a fairly high amount of emollients in the formula. Some of the emollients are quite nice too and include some of my favourite emollients (Shea Butter, Cetearyl Alcohol). Again, we see Ceramide 3, which I do like. I guess I don't have that much to say about this - it's formulated to be a nice, not-too-heavy emollient cream, and has the benefit of Ceramide 3 as well, which makes it a little different from other typical emulsions out there. And like the Moist Toner, it also doesn't contain anything potentially irritating or sensitizing - no fragrance, alcohol, or anything. I'm aware that some people don't like fatty alcohols as they may make a product feel heavy, although they are perfectly fine on most skin types, including my own acne-prone, sensitive skin. But if that's you, then the product does contain some fatty alcohols. 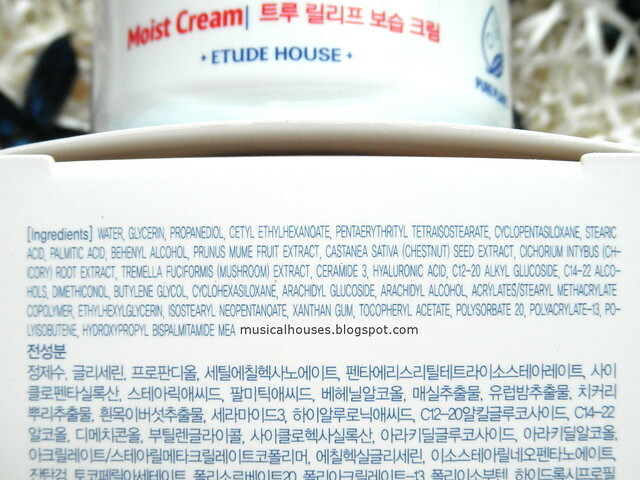 On the skin, the Etude House True Relief Moist Emulsion basically functions as a lightweight moisturizer. I know that this is meant to be the intermediate step between the Moist Cream and the Moist Mist Toner, but really, for some people, this can be a moisturizer by itself, especially if you don't have particularly dry skin, or live in a more humid climate. It was nice on the skin, with the texture of a light cream moisturizer, and it felt emollient but not heavy when applied. It worked quite well for me - it didn't trigger any sensitivities, and left my skin moisturized. 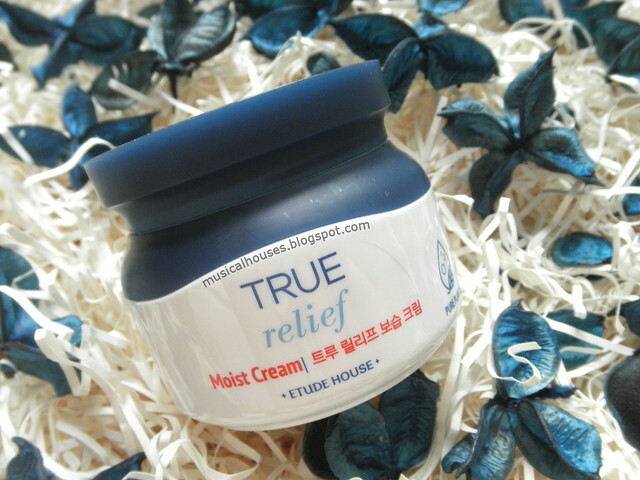 Lastly, let's take a look at the True Relief Moist Cream! This is basically a moisturizer, and is packaged in a plastic tub. It's the last step if you're using all the True Relief products together, after the Toner and Emulsion. 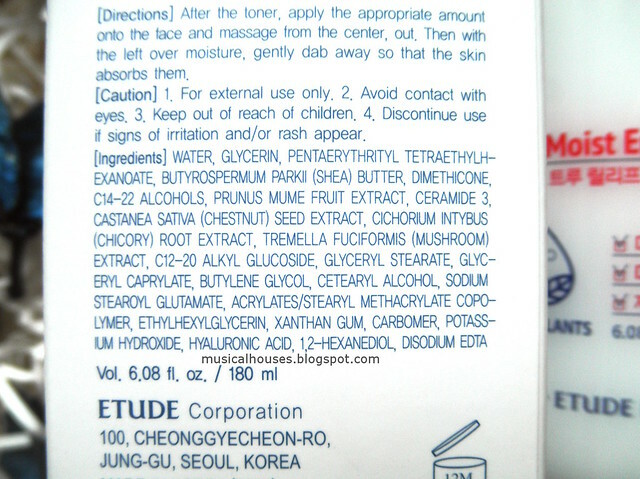 The ingredients in the cream are water, humectants (Glycerin, Propanediol, Hyaluronic Acid, Butylene Glycol), emollients (Cetyl Ethylhexanoate, Pentaerythrityl Tetraethylhexanoate, Stearic Acid, Palmitic Acid, Isostearyl Neopentanoate), some silicones (Cyclopentasiloxane and Cyclohexasiloxane, which evaporates on application after spreading out the product, Dimethiconol, which functions as a skin conditioning agent), emulsifiers (Behenyl Alcohol, C14-22 Alcohols, C12-20 Alkyl Glucoside, Arachidyl Glucoside, Arachidyl Alcohol, Polysorbate 20), most of which also have emollient properties. Then, we get the familiar plant extracts (Prunus Mume Fruit Extract, Chestnut Seed Extract, Chicory Root Extract, Mushroom Extract), and Ceramide 3, like the Emulsion. And we also have film formers (Acrylates/Stearyl Methacrylate Copolymer), preservatives (Ethylhexylglycerin), thickeners (Xantham Gum, Polyacrylate 13, Polyisobutene), and Vitamin E (Tocopherol Acetate). There is also a little bit of Hydroxypropyl Bispalmitamide MEA, another ceramide. So, from the ingredients list, we can see that the Moist Cream is just that - a moisturizing cream with both humectants and emollients, and definitely formulated to be quite emollient on skin. This is also formulated to have a thicker texture than the Emulsion, which is a bit more watery. And of course, we have the same set of plant extracts, as well as Ceramide 3, as well as the addition of another ceramide. And we also see the same absence of fragrance and alcohol, as well as the presence of fatty acids. I'd say that this is probably a thicker, creamier version of the Emulsion. When I used the Moist Cream, I found this to have the thickest texture out of all 3 products, as expected. The Moist Cream is really emollient, and does leave behind some residue when applied on skin. While it might be a bit too much for more humid climates, it's probably a great product for cold, dry climates or the winter season. It might also do pretty well as a night cream, too. And like the rest of the products, my skin was just fine with it - no complaints there! 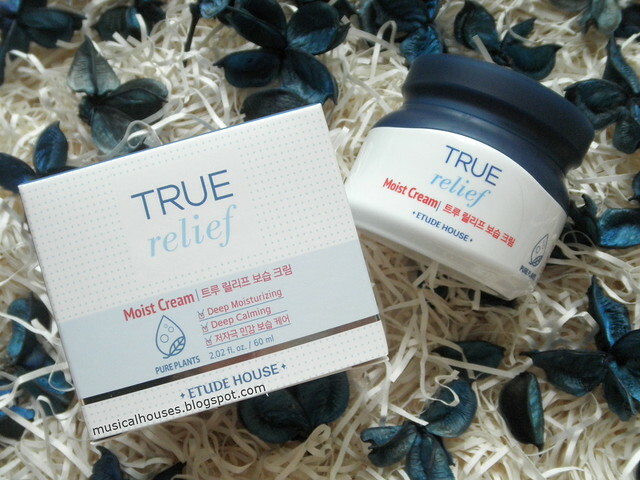 So, would I recommend the Etude House True Relief range? I think yes! Between the non-irritating, sensible formulation, and the inclusion of Ceramide 3, from an ingredients standpoint, I don't think there is anything I dislike about the product range - perhaps the only people who might dislike it are people who have oily skins, who might find the range a bit too rich for their skin. My personal favourites from the line are the Toner and Emulsion, just because the textures of the product mesh better with the hot climate I live in. And it's fairly affordable too - the Toner and Emulsion each cost S$27.90 (which is a good deal considering you're getting 200ml of Toner and 180ml of Emulsion), and the Cream costs S$32.90 for a 60ml tub. At those prices, I think it's definitely worth a shot, particularly for those with dry, sensitive skin, or who live in dry climates. The Bottom Line: Etude House's True Relief skincare line does live up to its promise of being suitable for sensitive skin - it is fragrance and alcohol free, and formulated with Ceramide 3 to boot. I bought the toner a few weeks ago because I was also impressed with the ingredient list. I was looking for a new toner with nice, non irritating ingredients. Etude House seems to get really better with skincare. I loved their Pink water line and this one is also great! I was searching some products to use on my combination-acne prone sensitive skin. And I thought that these products would be a good choice. They really seem to be very moisturising and gentle to skin. But it could be good if they bring some ingredients like niacinamide or tranexamic acid. it is indeed very moisturising and gentle! I have a combination-sensitive skin and it's doing very fine with these product. No breakouts at all. I'm using the emulsion and cream for 5 months now and would definitely recommend it for you if you are looking for moisturising products. Yes, it might not be a fancy niacinamide, galactomyces or snail product but it does what it claims: moisture and relief your skin from it's dryness.